The massive infantry battles of Star Wars™: Legion are coming soon to your tabletop, challenging you to step into the role of a general at the height of the Galactic Civil War. 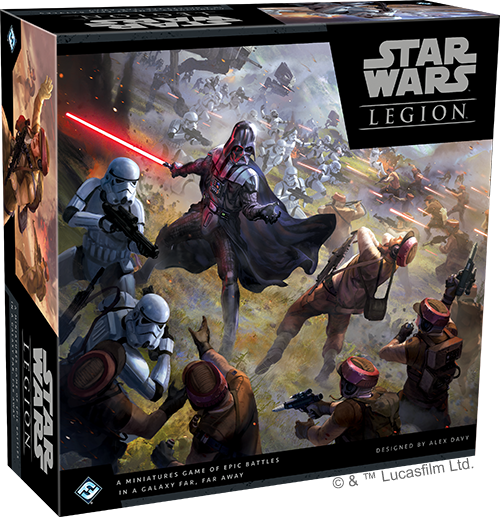 The Star Wars: Legion Core Set, along with eight other expansions, releases on March 22nd, and now is the perfect chance for you to pre-order your copies! In fact, Fantasy Flight Games is proud to announce a special bonus for players who pre-order the Star Wars: Legion Core Set from our webstore! (This pre-order promotion is available through your local retailer as well. Contact your retailer for more information on how you can get these posters through them.) All players who pre-order the Star Wars: Legion Core Set on the Fantasy Flight Games webstore now receive a stunning promo item—five 8.5” x 11” Star Wars: Legion posters, printed on high-quality, glossy paper, and displaying the battles of the Galactic Civil War in vivid detail. 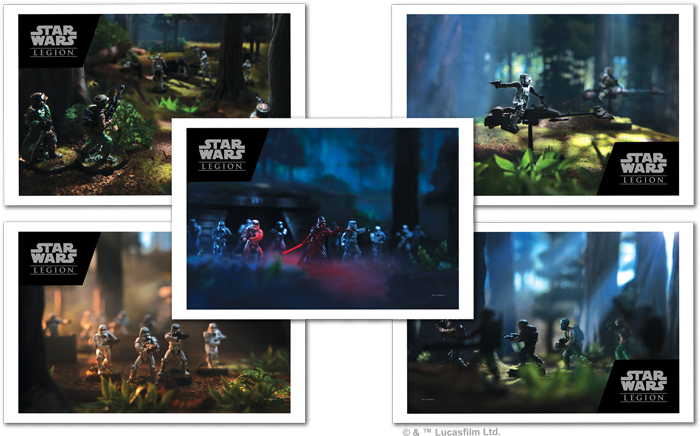 These bonus posters are included as a free gift for all players who pre-order the Star Wars: Legion Core Set from the Fantasy Flight Games webstore, including players who placed their pre-orders before the announcement of this bonus. These posters will be sent to you together with your copy of the Star Wars: Legion Core Set! You may accompany a squad of Stormtroopers moving forward in the early morning light, searching for Rebellion soldiers. Or, you might join the Rebel Alliance yourself, walking with Rebel troopers by moonlight and spying on the Empire’s advancing troops. You can watch two 74-Z Speeder Bikes whipping through the trees, kicking up plumes of dust with their speed. You may even behold Darth Vader himself, stalking forward through the midnight fog with squads of Stormtroopers supporting his advance. No matter what Star Wars battles you’re about to play out on your tabletop, you can capture thrilling moments for yourself in these five Star Wars: Legion posters. To receive your own copy of these posters, pre-order the Star Wars: Legion Core Set on the Fantasy Flight Games webstore today! Or, contact your local retailer to find out how you can get these posters through them.